Il est situé derrière l'amphithéâtre romain par les Etrusques n 6, est libre, toujours ouvert et a un minimum de services, le chargement et le déchargement. A super place for 1-2 nights, especially with dog(s). Quiet, huge, empty (lowseason, March). 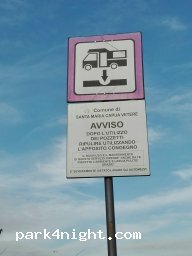 Si trova alle spalle dell'anfiteatro romano in via degli etruschi n 6, è gratuito, sempre aperto e possiede i servizi minimi di scarico e carico.Grande parcheggio su autobloccanti vicino all'anfiteatro. 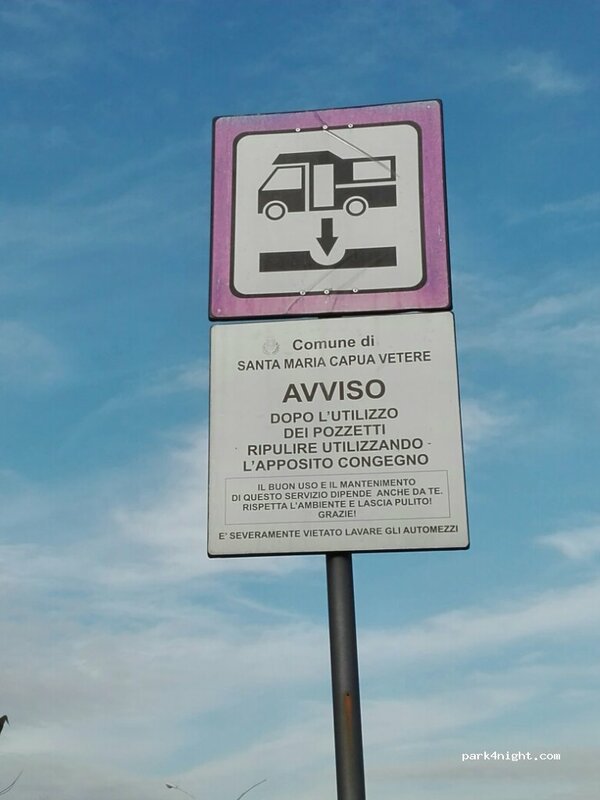 Comodo CS sempre aperto e gratuito. Ruhiger großer Parkplatz mit Entleerung. Amphitheater ist ums Eck. Wir verbrachten hier eine Nacht. Relativ laut, da es direkt an der Straße gelegen ist. Viele Spaziergänger und Leute, die auf den Parkplatz fahren, dann aber in den Autos sitzen bleiben. Viel Müll, Mülleimer allerdings vorhanden. Ver-und Entsorgung ebenfalls vorhanden , nutzten wir aber nicht. Für eine Nacht ok. Tagsüber sieht man einen zwielichtigen Mann auf dem Parkplatz. Stayed here Thursday night, there’s bad traffic on the road so quite noisy when parked up. We were there a few hours before a few local youths decided to set off firecrackers and fireworks at the end of the car park. If there had been anywhere else free to go we would’ve left but luckily the youths left later that evening and we were able to spend the night relatively quietly. 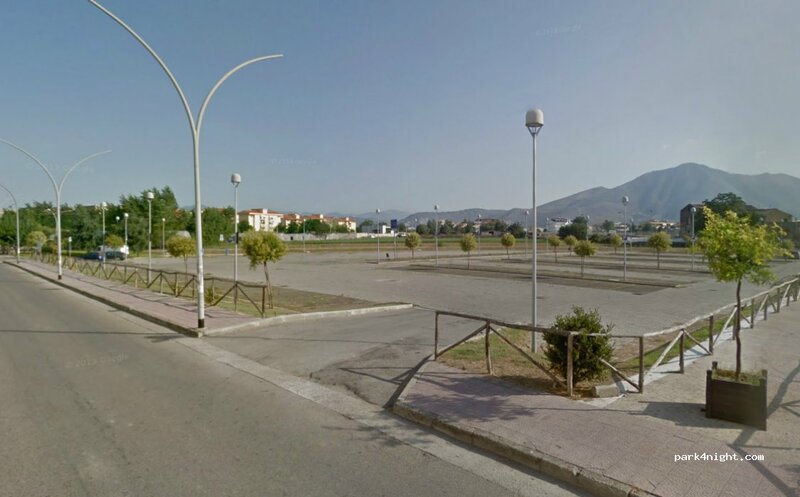 Wouldn’t stay again, it’s a busy built up area with young people using car park till late in the night, and first thing in the morning wouldn’t like to be there on a weekend. Only good points is that it has facilities to empty and fill. 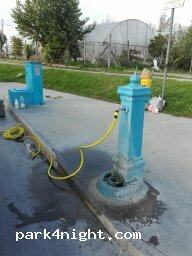 Zona amplia para pernoctar, no hay servicios solo para descarga de agua.Los fines de semana van muchos chicos con coches y se quedan hasta tarde, por lo demás es tranquilo.Siempre hay gente paseando perros y tiene un pequeño supermercado cerca. Good place to stay for 1-2 nights. You can hear a bit the traffic. Random cars are coming and going even late evening. Bit weird. 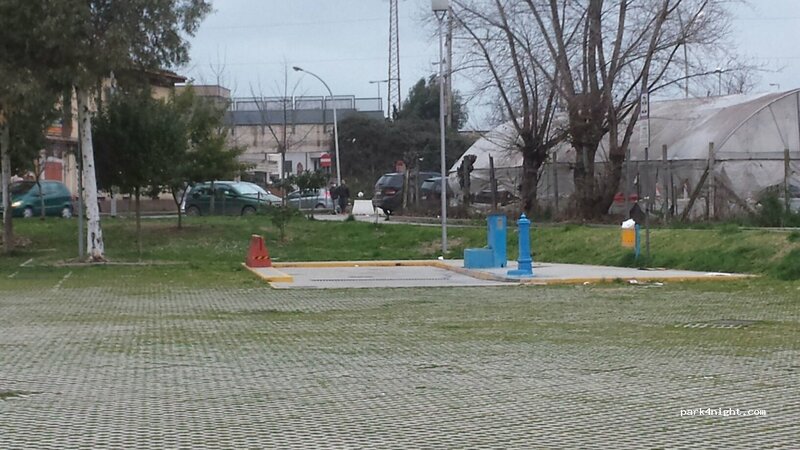 Parquing con mucho espacio y llano. 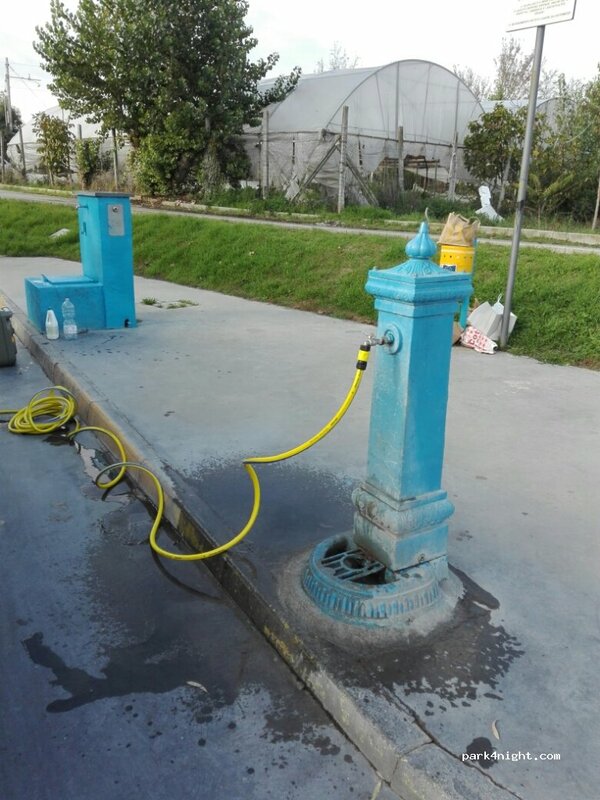 Instalaciones para vaciado y llenado. En nuestro caso la noche fue muy tranquila, hasta las 6 de la mañana que hay gente paseando los perros. Nos hemos sentido muy seguros. 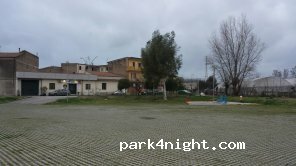 Free parking with lights in the night if you park in the area reserved for campers (first row). We slept here on a friday so there was quite a bit of „traffic“ in the darker areas of the parking lot but we felt absolutely safe. 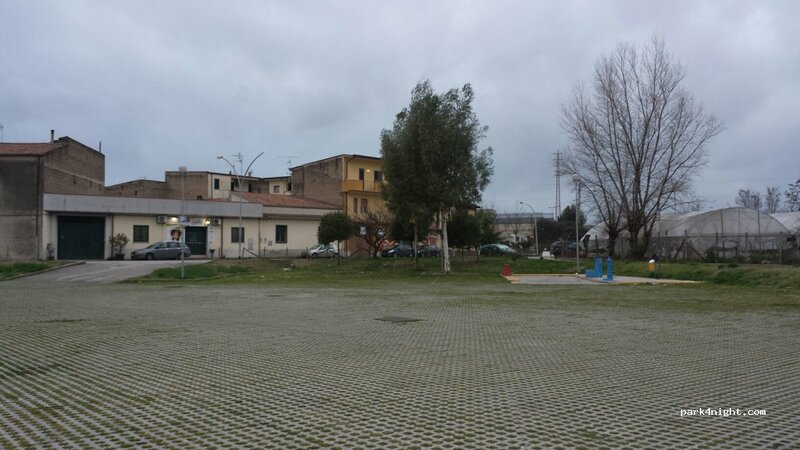 Ottimo, gratis acqua e scarichi! Good free parking with a lot of space, we did feel safe, lots of people with kids and dogs. Good to stop! 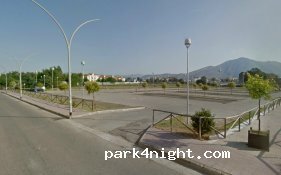 Parcheggio gratuito, con servizi di carico e scarico sempre gratuiti, ben illuminato, ho passato due notti tranquille, la sera è frequentato da ragazzi . Services et parking gratuit proche de Naples. Un peu de passage en soirée avec des jeunes qui viennent prendre du bon temps dans leur voiture en soirée. La nuit fut très calme et le matin aussi d'ailleurs ! Gratuit, proche de l'amphithéâtre et de Naples. Parfait. Eau, grand parking, pas trop de monde, de l'espace. Ce n'est pas un endroit de rêve mais c'est tellement dur de trouver à se garer gratuitement à côté de Naples qu'il est le bienvenu.